Ever wonder how to do polka dot nails? 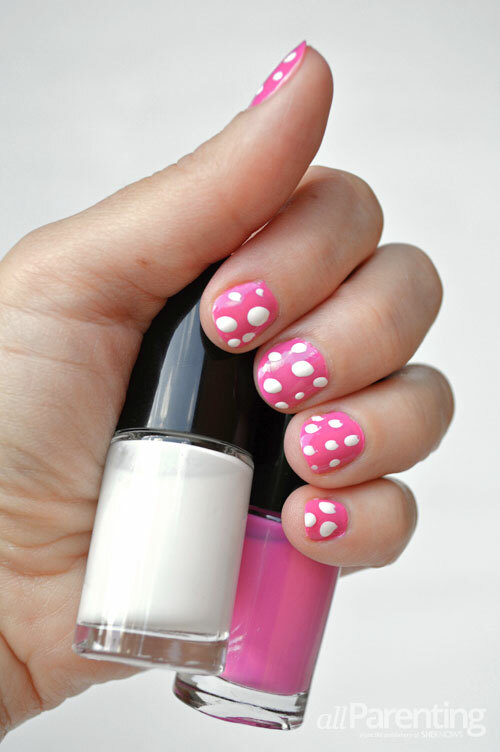 We've got you covered with this polka dot nails tutorial! Easy nail designs take minutes to do and are as sweet as can be! You're going to love the look and style of these polka dot nails! There's nothing sweeter than polka dot nails and this simple DIY will have you creating a perfect polka dot manicure in no time. The clever secret to those adorable dots is dipping the tip of a bobby pin into your nail polish and using that as your dot maker! Start by manicuring your nails. Polka dot nails look adorable on all shades of polish, so pick a tried and true favorite or try a fun and whimsical color. Paint your nails with two coats of polish and let them dry completely. Carefully dip the bobby pin into white nail polish. Practice dotting on a piece of paper noting that the more polish on the pin, the bigger your polka dot turns out. Once you've practiced dotting, carefully polka dot your nails. Polka dot nails look equally sweet when the dots are uniform and when they're slightly different sizes. Consider polka dotting every nail or just one nail on each hand as an accent. Let the polka dots dry completely. Finish this adorable look with a clear top coat and your polka dot nails are ready to be shown off!